I have found a new obsession, literally with washing my hair! 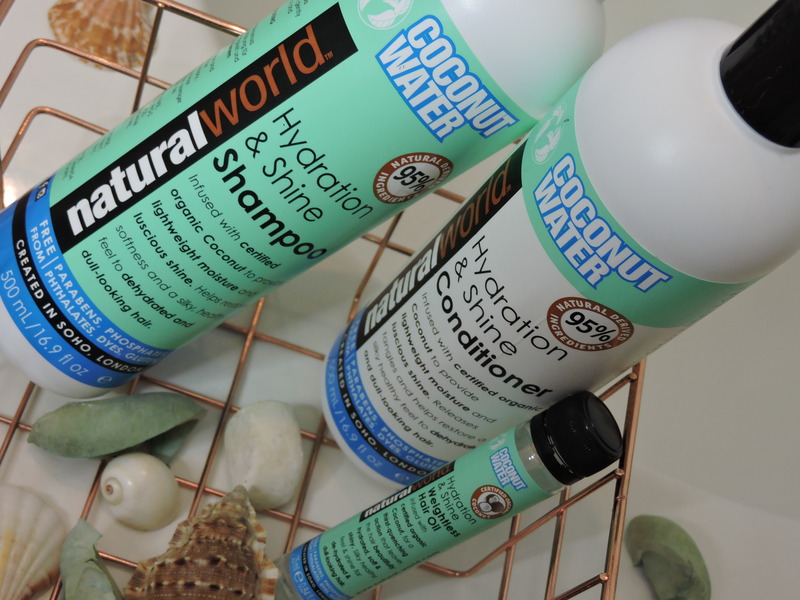 The brand Natural World came into my life and I have been so obsessed with using their products. 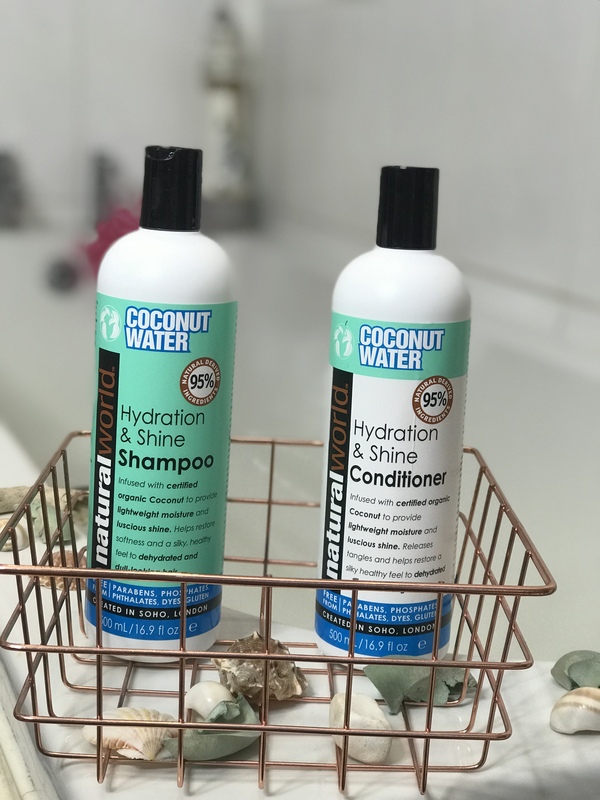 After they kindly sent me* their coconut water shampoo and conditioner and the hair oil, I have been using them every single time I washed my hair. 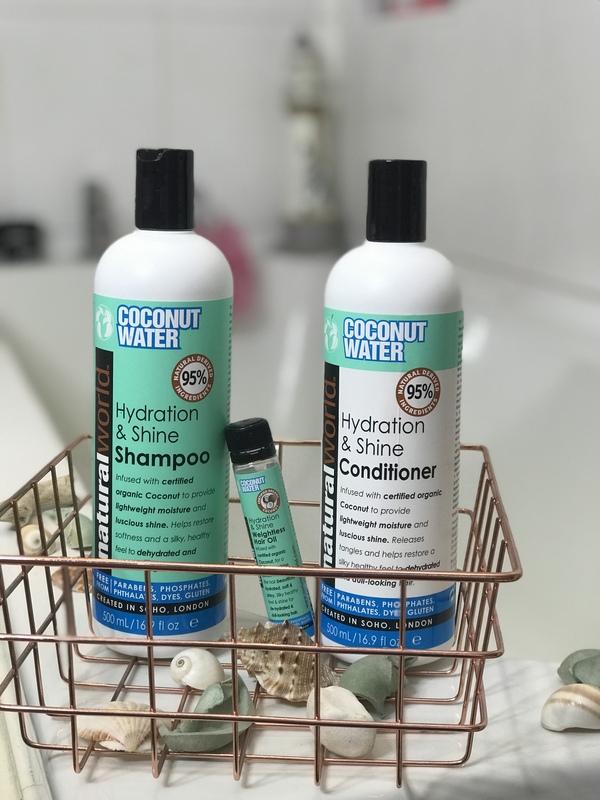 These products are said to help with dryness and frizz, as I dont really have frizzy hair I can’t make a comment on that, however, they do help with dryness. 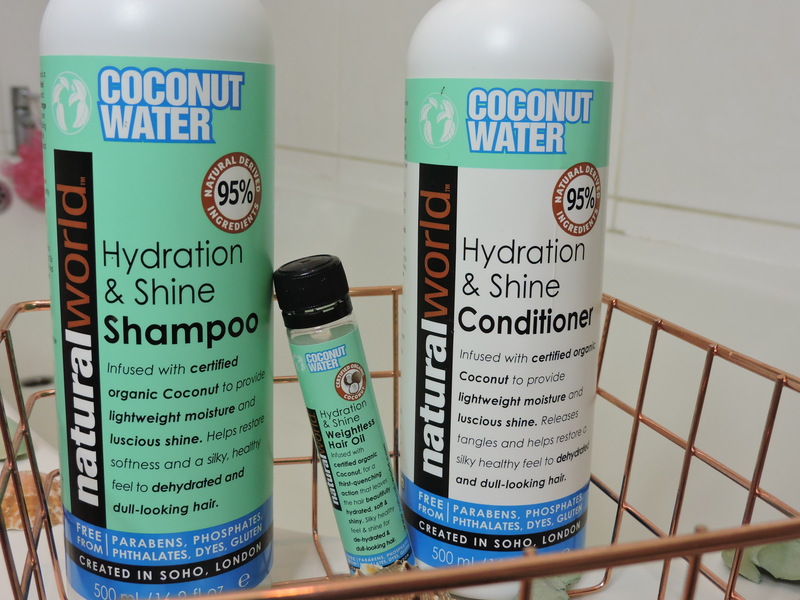 They sent me their Natural World Coconut Water Hydration & Shine Shampoo, Conditioner and their Weightless Hair Oil. The shampoo and conditioner both have 500ml of product and the oil has 25ml of product, which is a lot of product for a shampoo and conditioner and oil (a little bit goes a long way with the oil. I have used these now since I got sent them so about 3/4 weeks maybe.. and I have used the oil every single time I have washed my hair, a little bit goes a long way and so it looks as if i havent even touched the oil. So first lets talk about the packaging. The packaging isn’t my favourite, I like the size of the bottles however I think they could up their game with the packaging. I think they could have been more creatie with the packging. Even if the plain bottles were actually see through so you could see the contents inside, I think that would change the products a lot. I prefer the way the oil looks because i like that it is in a little tube and that you can see inside the tube. Maybe, having it as a little dropper rather than having to pour the oil out, could have been good and potentially less messy. They have a really subtle coconut smell and I really like that as coconut isnt my favourite scent. The oil definitely has more of a stronger scent then the shampoo and conditioners do. 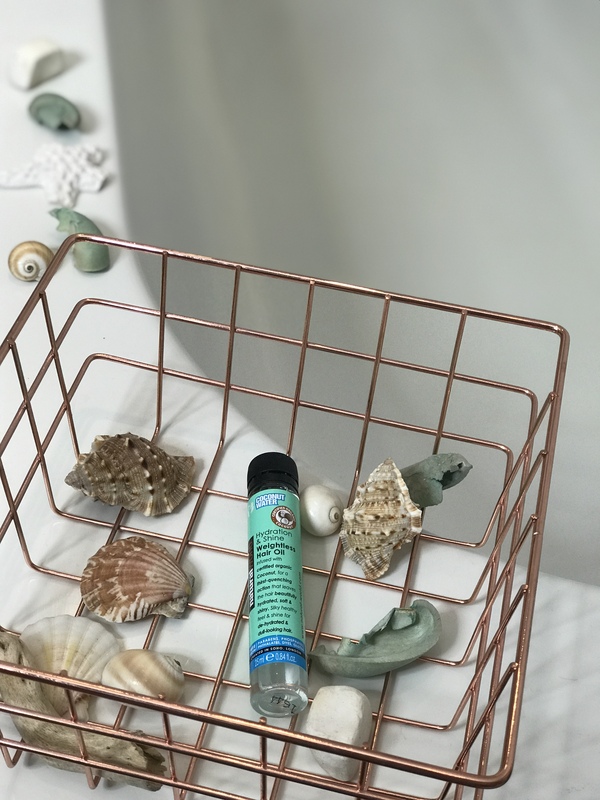 I have been enjoying using this because I like that it really makes my hair feel throughly clean and fresh (that sounds as if I never wash my hair) but because they are natural, it makes them feel even more clean. As there is nothing artificial inside and everything is all naturallll! This shampoo makes my hair feel so smooth and so soft, I can’t remember the last time I used a shampoo and really looked at my hair and thought. OH MY GOSH, MY HAIR LOOKS SO REFRESHED AND SOFT! I look at my hair and I can see how smooth it is! THIS CONDITIONER IS THE B O M B!! HOLY MOLY! this conditioner is one of the best conditioners I have used in such a long time. It is sooo THICK and I need to emphasis that, it reminds me of an actual hair conditioning treatment because it is soo thick. I definitely prefer this because my hair needs all the conditioning it can get. I have blonde hair and it can get very very dry! therefore, this conditioner is so essential for me and has done my hair wonders! my hair looks smooth, well conditioned and doesn’t look dry at all which is something that I can now see. One thing I will quickly add on to both of those is that because it is coconut water, I have found that my hair gets greasy a lot quicker. So normally I can go 3/4 days without washing my hair (using dry shampoo) but after the first couple of times of using the shampoo and conditioner, I noticed that my hair was getting greasy on the second day! since I have been using it for a bit longer, my hair has sort of got used to the products and now it doesn’t get as greasy as quick. This oil is amazing!! I love using oils for my hair because it does get very dry. I feel like this and the conditioner is keeping my hair is such good condition. It makes them smooth and just looking healthy. It doesn’t make the ends of my hair greasy either, which is what I like as some oils can make the ends of your hair really greasy. A little bit goes a long way and I have been really liking using an oil after every time I wash my hair. My hair loves coconut oil on the ends, this is the sort of oil I would normally reach for for my hair. I really love these three products and they are HONESTLY making my hair feel so soft and just so confident with my hair. I don’t currently *looks down at ends of hair* have any split ends which is good and I honestly think it could be from using these products. I think they work very well together as an all three type of product. You can pick these up from Tesco and they retail for £5 each which isnt a bad price at all, considering you get alot of product inside each one. What do you think of these? sound like they would be up your street? I haven’t tried these before! Sounds really good. They are really worth trying! I’ve not heard of this brand before, but I agree about the packaging it doesn’t make it appealing! never seen these products, but very interesting. great article!